Conrad's cuff checklist had a spread of Angela Dorian (Miss September 1967) with the line "Seen any interesting hills & valleys?" written beneath it. On another page, Reagan Wilson (Miss October 1967) was displayed as a "Preferred tether partner." Bean's cuff checklist had Cynthia Myers (Miss December 1968) and "Don't forget—describe the protuberances" on one page. On another was Leslie Bianchini (Miss January 1969) and "Survey her activity." Back up in the orbiting command module, Richard Gordon was surprised to find a playmate—DeDe Lind (Miss August 1967)—taped to his locker with the label "Map of a Heavenly Body" attached. Flight Commander Pam Melroy had banners from her nephew's school district and her college alma mater placed in the OFK. Mission Specialist Doug Wheeler, who had befriended childhood hero Bobby Murcer after the former New York Yankee was diagnosed with a brain tumor, had placed Murcer's jersey and baseball card in the OFK, planning to give them to Murcer as gifts. One item placed in the STS-120's OFK was the lightsaber prop used by Luke Skywalker inReturn of the Jedi. George Lucas asked for it to be taken into space in honor of the 30th anniversary release of his Star Wars: A New Hope. Spaceflight has long had an uneasy partnership with advertising. NASA gave Lifemagazine exclusive access to the original Mercury 7 astronauts and their wives. Lifechurned out articles and even a few books depicting the astronauts and their families as average, middle-class Americans. In exchange, the magazine provided the astronauts with huge life insurance policies. When Apollo 11 landed on the Moon in July 1969, 94 percent of American televisions were tuned in. That was advertising exposure no company could pass up. Every contractor that had anything to do with sending Apollo 11 on its lunar excursion developed elaborate press kits with the flight's logo emblazoned on the cover. Tang became the drink for "spacemen and Earth families." Omega Watches became the watch astronauts wore on the Moon. 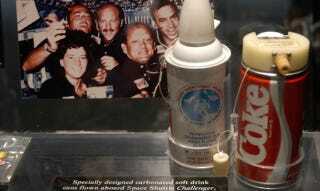 Then Coke got into the act when they spent $250,000 to develop a can that would dispense Coca-Cola in zero gravity. The company even changed their formula to make the beverage easier to drink because carbonated drinks are difficult to keep in the stomach at zero gravity. When Pepsi got wind that NASA had agreed to send the Coke dispenser up on a shuttle, they spent $14 million to develop a "space can" of their own. Thus began the "Cola Wars in Space" that even lassoed proponents in Congress into the debate. Coke suddenly became the preferred drink of Democrats, while Pepsi found favor with the Republicans. Finally, the Challenger shuttle was sent into orbit in 1985 with four cans of each cola. The five-person crew tested the drinks out and hated both brands. That didn't stop Pepsi from launching a media blitz, calling their product "one giant sip for mankind." The test flight's only cargo was hidden in a drum bolted to the floor of the capsule with the words "Top Secret" and a spotted cow sporting galoshes imprinted on the lid. This was a reference to the 1984 comedy Top Secret. Rumors circulated about what might be inside, and once the Dragon lifted off, SpaceX's CEO Elon Musk dropped a hint: "If you like Monty Python, you'll love the secret." Many speculated that it was a can of Spam, a reference to "Spamalot" from Monty Python and the Holy Grail. In March 1965, Aleksey Leonov became the first human to perform an extra-vehicular activity (EVA), hovering in the vacuum outside the spacecraft. Leonov's suit became over-pressurized, ballooning to such an extent that his feet were no longer in their boots, his hands no longer in their gloves. He could no longer reenter the spacecraft feet-first and had to wiggle inside head-first while bleeding pressure from his suit. Things got worse when they tried to reenter Earth's atmosphere. The automatic guidance system was not functioning properly, and the cosmonauts had to reenter manually. Worse, they had only enough fuel for one course correction. Their capsule parachuted them 1,500 kilometers (930 mi) west of their intended landing site, deep in a thickly wooded Siberian forest. And it was mating season, when Siberian wolves and bears were at their most aggressive. They did have a pistol but had little else to survive in the wilderness. Fortunately, they were found just hours after landing and were rescued the next day, skiing 9 kilometers (5.6 mi) to a site clear enough for a helicopter extraction. In 1968, a survival kit was developed for all Soviet space missions and included a Markov pistol. The Markov was replaced with the TP-82, and in 2006, the TP-82 was replaced with a semi-automatic pistol. And, yes, the automatics are still part of Russian survival kits, and that means the cosmonauts occupying ISS are indeed packing.